This is one of the nastiest parts of the interface, by necessity. It was a bear to even update it in the first game, and so it remained one of the oldest-looking and most confusing screens -- as well as one of the first ones that new players are confronted with. We're really needing to strike a goal between surface simplicity with infinitely-expandable depth and extra options, in my opinion. That said, some things are simply best not being part of the lobby at all, but instead becoming a part of the early gameplay. That lightens the load on the lobby GUI in terms of mental overhead for everyone, and lets players make certain decisions AFTER they have gotten at least a little bit of a lay of the land. Take our quick poll and give us your feedback on the "Start New Game" Lobby Interface! Not me, gimme the relevant info in a lobby screen - ie who I'm playing with, etc. while most people can guess on what the randomize button does, maybe renaming it to Randomize Seed would be a better option (if it fits there with weird resolutions). I think you can let the visualization of the rendered star map speak for map types. Once people click, it's going to be obvious. Getting them to click, now that can be a problem. A tooltip on highlighting "Map Type" saying "Select between Galaxy Star Distribution Styles" or something might help there. Should the map screen the first thing people see? I'd rather let people pick a name and color for their profile first, I guess. But otherwise, when you hit a new game, I think it should be the map screen, yes. Bring it back please? You can trim a lot of it off. Also, you're right that english speakers (most of the world, really) would look at top left, but videogames and real life machines are generally using bottom middle for control interfaces for years. Car speedometers, smartphone menu buttons, WoW action bars, Star Craft unit orders, dark souls item bar et cetera are good examples of that. Basically, top of the screen is for important information, bottom of the screen is for decision making. There's a case for putting it on both bottom and the right, like homeworld build menus and command&conquer RTS series. Trim the edge detection and put a stricter limit on scrolling distance via edge scrolling, perhaps. Or only allow edge scrolling above the menu bar and not below it. Edge scrolling is intuitive in a mouse interface. Especially if it's retained in planet view. Your average player, when represented with a RTS UI will keep their dominant hand on the mouse as it's the way to control things. Don't take that away. Also, not introducing weird edge cases like scrolling not working in one menu but working well in others isn't a good idea. Just like sanitizing your databases, you want to sanitize your UI. Let the player options out of there! Condense the color selection into small boxes with colors like in AIW1. I think the semi-transparent backgrounds are very good when it comes to separating the map from the rest. 1) the meat of the options menu, plus other amenities. I think separate windows for options and factions would make sense with the re-addition of #3. 2) player list with clickable names to show their selected homeworld, bonus ship type, and if it still exists, resources in homeworld system, with tooltips explaining what they are preferably. 3) Enemy options can be put here for a quick selection, condensing the bottom bar visually. 4) The ubiquitous chat box, shamelessly stolen from AIW1. We should see our names or at least an indication that players are the human remnant, I agree. Also, color swatches for color picking instead of words, I guess! Instead of using scroll bars on top of the map menu, you can use a different screen instead. Frankly, the scroll bars became too much on AIW1. I have vision on both the submenu and the map! Does that give you any tactical information vis-a-vis enemy factions? Does changing anything in the submenu actually change the map in itself? You said it shouldn't regenerate on color changes, and I agree! However, you also mentioned being lost in submenus, so I guess the answer is simple - make it a pop-up that doesn't obscure everything on the screen. AI sentinels is a bit weird compared to two fleets posted just under it. AI Sentinel Defense Fleet? I dunno, I'm drawing a blank here. However, just bolding the name itself would give it visual panache that elevates it above the warden and the hunter fleets. Plus, tooltips would help. Options Why not make it 'other game options' along with another button for the actual options menu? Say, I just hopped on a game with a buddy, but I was playing solo earlier and I want to change sound settings. Or I installed a mod but I don't want to play with it on this particular game. Why not allow players to access system settings in the map menu as well? Anyway, on to the game options things. You really want to make it superduper streamlined, tooltipped and grouped and engineered. Might want to sanitize the game options menu that options added with mods are visually distinct from game's default options. How do you do that without being super overwhelming? Well, partitions. Group things up that make sense. Keep things intuitive. This is something you guys will have to reiterate a bit, and without any examples I can't give enough feedback on that. That'd be great! That's good feedback to the player that their mindless clicking is doing something. And yeah, going back to a good random seed would be nice. Oh boy. That's, ultimately, a game design choice. From the GUI standpoint though, whatever we end up with, it should be communicated in the map menu. Welp, that's about it from me. If I missed anything in that 30 minute vid, I blame lack of coffee. 3) Start button should be in the corner. People are used to important buttons like that being in there. Quit should probably say something like "Main Menu" or "Back to main menu" and would be OK if it's to the left of Start and of the same size and shape. 4) There are 2 fonts on this page. One of them is StarCraft 1 Menu font if I'm not mistaken. There it was used for big buttons, here it seems to work as default label. I think it's OK for big important buttons but doesn't work for labels. And anyway it's too recognizable and associated with StarCraft. I'd suggest using a single font here for everything apart from big important buttons, I already made some suggestions in Main Menu. (ugliness is intended). Or perhaps you may have a separate big button "Generate Random Map" that randomizes seed and generates the map and that seed textbox has a little tick button integrated in it - I think it would be the most obvious solution. This is a long post with a lot of questions. One of the neat features of this forum software is after you hit reply it shows previous posts beneath the reply box. You can scroll down to that post and find the relevant section, highlight it and hit "Quote (selected)" and it pastes that quote into the bottom of your reply. Since there are a lot of questions though, feel free to just copy/poaste this whole block and just type "Response: (your response)" or whatever on the line right below each question. The goal is to have a simple menu with a bunch of "advanced" or "more" toggle/buttons/links to get to the other options, but keep in mind how many clicks it takes to find or get to a particular option. Should there be edge scrolling on this screen? Some of the buttons are close to the edge and it seems easy to accidentally edge scroll. Most items will have tooltips explaining the questions and/or options, but many are not implemented yet. Mouse wheel currently zooms the map instead of a dropdown box even if the mouse is in the dropdown box, but that is currently planned to be changed. There is currently not a sidebar pictured, but one is planned to be implemented with information outside of the options presented at the bottom. If you hate RTS interfaces, do you hate the idea of a sidebar with the chat and player colors, etc. Is there a better idea? Should the sidebar be on the left instead of the right? The options selected to create the game are currently in a menu at the bottom. The menu currently is a series of tabs across the bottom divided into "Map", "Factions", and "Options" with "Map" displayed initially. Should this menu be at the top instead? Should this tab be the first tab displayed? Is it clear what the generate button does? One of the purposes of it existing is there are some randomly determined factors even within a single map seed, such as the background starfield. That background starfield can be different for each player as some people may not like some starfields and can disable them, so by pressing generate it randomly selects a background for each player based on which ones they have allowed. Is it clear what the randomize button means? This is currently the tab where the player, the main AI factions and optional minor factions can be added and edited. Currently it looks like there is a limited amount of room for factions. Is there a better way to lay this out to leave room for future expansions and modding without having to resort to a scroll bar? Keep in mind that currently the three required AI factions and the players are listed in these minor faction slots and a multiplayer game could crowd out the minor faction options. The player's faction is listed as "human remnant". Should it say the username instead? Currently multiple factions can be set to the same color, is this okay? Currently the faction name, the faction color and the faction variant (such as AI type) are displayed on this screen with more options such as difficulty hidden behind a "More..." button. Should this be rearranged or is there perhaps another way of nesting this information? The "More..." popup is currently in a placeholder location, where would be a good place to display it? The "More..." popup is currently on a translucent background, but also the name of the faction in the popup is colored the same as the faction color so this could cause readability issues. Should the box be opaque? What would be a good way to present the priority of options in the "More..." popup? Different sizes? Grouping the options together? Keep in mind that modders could change or add a lot of options to these menus and it needs to scale well. One of the AI factions is called AI Sentinals (versus AI Warden Fleet and AI Hunter Fleet). The AI Sentinals is actually the main AI and is the important thing to modify or set the difficulty of. What is a name that better communicates that as opposed to it just being one of three opponents? Currently the only option in this menu is whether to start with units queued, but this could be the location of a lot of options from mods. What is the best way to organize that without being overwhelming? How does this impact the starting decisions for a player? Does selecting a starting planet even matter since the reward does not come with it? Should there be some kind of game-affecting customization from the start of the game? If so, is this front-loading too many decisions when the player may not know their impact yet? Should the choice of a special ship be delayed until the first time a player takes a planet (in addition to the normal ways to gain ships)? Is it okay for two players to have the same starting ship? If not, is it okay if those ships show up for unlock later for other players? Differentiation of players is cool, but it also restricts options. 1) As I've mentioned elsewhere I am convinced this is stuff that only advanced player has to see. Map seed, list of factions - there's no point for you to tinker with it until you have several games under your belt. 2) You've said everything about tooltips yourself. Those are necessary, of course. If you show this screen to any player he will probably try to lower the number of AI factions. Maybe make them locked if they're necessary? 3) Players are probably used to Blue being a default player color. Maybe us it instead of gold? 4) How about More... opening a popup on top of everything else? I think you don't need any other info from the table. This Civ limitation you're talking about makes sense, because your brain has only so much moving parts it can care about at any given moment, and new player would assume they have to perceive whole picture in general. Just make a popup with "OK" button so that you select everything you want here and move back to the table. 5) How about renaming AI Sentinels to AI Core or AI Mainframe? Thus it'd be obvious that other AIs are subjects to the main one and it's not a 4 side war. 6) Options - I really hope this screen would be called Advanced Start or something so my first idea to rename it to Advanced Options wouldn't work. But Options is a bad name; it assumes it's something you have to check out. Perhaps "Mods" would be a good name. I'd add a button "Set everything to default" on top and turn everything else into a table with pairs label - dropdown; i.e. Start with units queued - On/Off. IIRC AI War had really obscure tweaks there. Also organize it in categories potentially. "Mods" would work fine to make user understand it's not something you tinker with for a normal gameplay. If edge scrolling is in the game, edge scrolling should be in this screen unless the galaxy map is fixed and the view cannot be manipulated at all. Tooltip EVERYTHING. Even if it seems obvious, if you have the time tooltip it anyway. I hate the tunnel vision older RTSs have where there is a ton of real estate devoted to a bottom bar and a ton to a sidebar and a tiny window to see the game itself. I understand this is just the galaxy creation screen, but anything to tuck away various UI elements until they are called or make them float translucently above the screen instead of giving the effect of shrinking your screen would be preferable. This menu bar is fine at the bottom, but I don't like the design buttons to access the various tabs at the bottom. They look like they should open large popups instead of just changing the display of the bottom menu. They should look more like browser tabs across the top of the box or maybe excel workbook tabs across the bottom. Yes, unless you split out the player factions separate from the computer-controlled factions (see later suggestions), in which the player factions should be the first displayed and that should help it sync up with what the host and the clients initially see (since they care about the player factions and the host is the only one that is really responsible for maps). 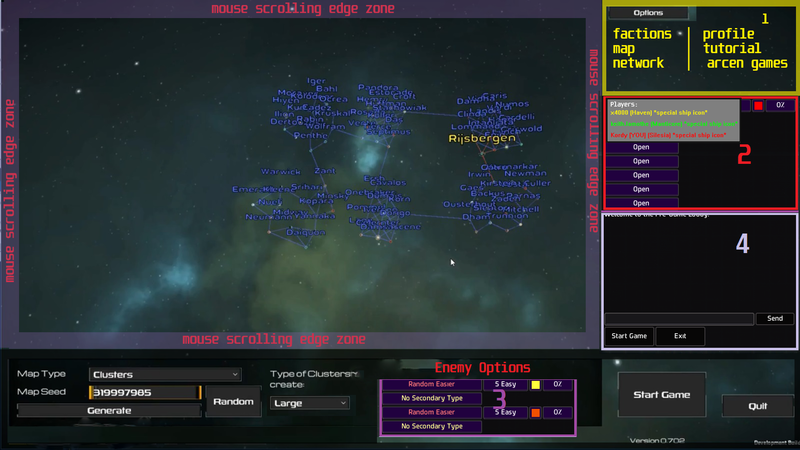 Kill the randomizing of starfield every time something is generated. Make it an option in the options menu or an option in the player faction tab (or randomize it on a per-planet basis). I really dislike it changing everytime anything changes and I don't like the idea of the host hitting generate over and over again until they find a starfield they like (which the clients may get a different starfield and request a reroll again). ilitarist made a good design suggestion for the map seed of having a check button (or maybe a "go" button?) and a dice button in the box with the map seed. 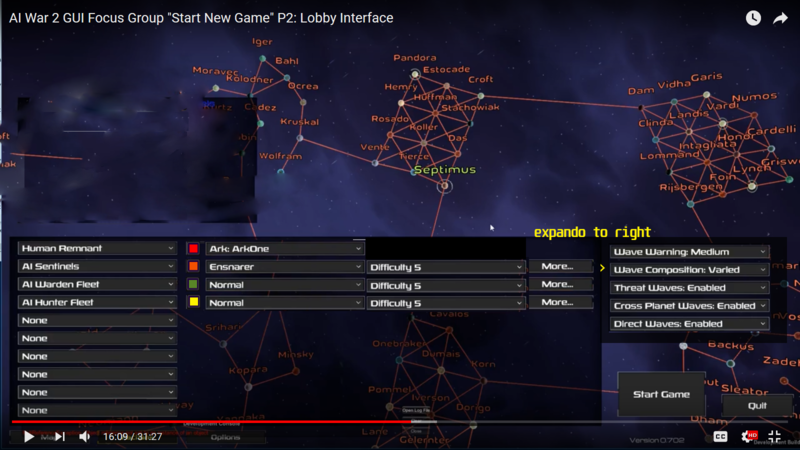 Maybe randomize the starfields when the lobby is first created but don't randomize it again. A lot of people (some in the other thread) have suggested renaming it "randomize seed". I agree although the dice icon from ilitarist works too and is very compact. Strip the player factions from this screen and give them their own tab. Maybe keep this tab called "factions" but call the player faction tab "players"? Let players (and modders) make their own problems. Display the recommended number of lines for factions, and add an "add faction" button for people to make more slots. This gives players an idea of how many factions there should be. Then give each faction an X button on the left to remove it (except for the 3 AI factions of course). Alternatively, if you want to make room for tons of factions, make each faction an icon on a grid and clicking on that icon gives you all the options. Endless Space 2 is an example of that (but I don't think clicking on the faction has a lot of options, so they can get away with it easily). No, because it can be done accidentally. You may also want to consider a color picker instead of a discrete list of colors (or if you want the discrete list in order to prevent too-similar colored factions, add some differentiation between red and orange). I like faction name, color and difficulty level, but I'm wondering if a per-faction difficulty is getting too specific. What does it mean to have a difficulty 8 hunter fleet but difficulty 3 AI Sentinels? If I turn hunter low and sentinels high, does that make a game that is hard to win but also hard to lose? I like control, but I'm not sure of the effect of the control here. If the three AI factions are mandatory, remove the drop-down box around their faction name in order to indicate this. I'm fine with "more" popups being center of the screen all-consuming popups. However I am also fine if hitting more squished the faction box down to just the faction name on the left (with the currently selected faction highlighted in some way) and then used the remainder of the room in the bottom menu to lay out the options. AI Sentinels does not appear to be any more (and in many ways it seems less) important than the two fleets. I would consider renaming it AI Fleet Command, AI Control Core, AI Central Processing or something. OR distribute some more of the options/importance into the two fleets because they FEEL like more of actors/agents while Sentinels feels like a bunch of pre-existing turrets (from the viewpoint of this menu at least). Unless you can tell me some more options you are planning on including in it for vanilla, I'd recommend calling it "mod options" or "mods" and get your stuff off of it. You can relocate whether you start with ships queued in the player factions tab to be chosen on a per-player basis. Theoretically selecting a starting planet only matters for: number of wormholes with access, ease of creating a bottleneck to protect the first world, and how long you will need to snake/scout to see all the planets. Since the Ark exists, does the first planet even matter anymore like the homeworld did in the original? If it doesn't then the first two considerations I just mentioned don't really matter either and only distance to scout does. In multiplayer games you can add positioning relative other players (next to, one-jump-away, divide and conquer different quadrants). But you can solve this by defaulting to one of those and adding more options in the player faction menu (or in the individual player faction's "more" menu) (like how Stellaris lets you distribute players among clusters or put them all in the same cluster, or just randomize). On one hand, almost no other 4x game lets you choose starting location and neither do RTSs (except for some situations where player number determines which of a fixed series of starting locations on a premade map you start at). So if the significance of the starting planet is downplayed such that choosing precisely which one isn't really an interesting choice: drop it. Many 4x and RTS games let you pick a faction at the start of the game. A single flavorful choice that either is inconsequential in the long run (because you unlock more ships) or is heavily balanced (because factions are balanced) is fine and does not reach western RPG levels of complex pre-game decisions (wRPGs that have this should really consider making it a new game+ option if it is present at all). However a lot of those 4x and RTS games spend energy imbuing your choices with flavor so the choice can be influenced by aesthetics and fluff and be made easier on the player. A single ship selection isn't the same thing. I recommend creating a shortlist of starting ships that feel somewhat impactful, are balanced, are distinct and flavorful. Maybe 5 ships? If you want to allow the choices of others, make it an "advanced/more" option (with a warning that they are not all evenly balanced as a starting ship) or a housemade mod, or a checkbox in the options menu. I do not like the idea of choosing a ship upon taking your first planet for two reasons. One is I wouldn't want a multiplayer game grinding to a halt the first time a planet is taken by coalition forces while everyone coordinates picks (or if each player chooses each time they take their first planet, that means some players may have to wait their turn to get their special thing). The other reason is what's special about the first planet you take? When you started with 0 planets, sure, but now that you start with one planet why would you get a ship upon taking planet 2? Shouldn't the game be teaching that taking special planets is important and not particularly rewarding taking "just any" planet? I would love the idea that beyond core ships all players have different ships (as long as you can't gift ships to other players, I hate feeling encouraged to give away the thing that makes me special or (even worse) making a boring pick that is good for the team because I need to give every player max cap of whatever it is). If you go with the idea of only 5 starting ship picks though, that creates problems in 6-player games. Maybe let people pick the same 5 starting ships (and not any future ships), but never under any circumstances allow those 5 ships to be found in-game? Maybe call them human remnant prototypes? For the AI Sentinels name, from the videos it seems as if the Hunter and Warden fleets are more aggressive than the Sentinels, who control mostly turrets and guardians. Maybe rename it to AI Defense Grid. "Which presentation of sidebars do you prefer?" I am voting "like AIWC" because I'm not actually sure and don't have a visual aid to help. "Should the difficulty level be set at the game level or for each faction?" I think this comes down to "it depends" but I'm voting "per faction"
I almost read the last question backwards ("which of these sounds like it is described by AI Sentinels" as opposed to "which of these would be a better name"). I would probably reword it to "which of these best describes the central AI command? (AIWC the "the AI" / homeworld)." Yep. This is really just a general "What feels natural to you" kinda question. The main thing is we think the name "AI Sentinels" doesn't convey that this is the main AI . We are looking for a better name that gets it across. I thought your phrases "central AI command" and "AI Homeworld" were interesting. Right, exactly, it doesn't sound like that that is what that is supposed to be, which is why I almost answered it wrongly. Just a wording thing that I stumbled over that others might have as well and may have influenced the voting result. e.g. I read it as "which of these things does it sound like 'AI Sentinels' is referring to?" Realistically, I think you guys did a really good job the first time around with this. Was it perfect? No, but it was an excellent foundation to build from I think. I think what really hurt it was some missing tooltips, that explained what sections like "AI Plots" was about. It was a lot of settings to start off with as a new person, so I think an "Advanced Settings" button would be helpful (possibly just above the menu box) which switched you between Advanced and Simple settings for the game, which then broken down the various menus all together. For example the Simple Maps Tab would show you the map Type and Subtype if applicable (maybe the system count for size as well if that comes back). The Advanced Maps tab would have all the additional bits around map Seeds, and any additional map settings that get tossed in for more finite map tuning. Bring back the AI Options/Plots Tab, but only as an Advance Setting. Bring back the right side menu for the players / enemies and make it a little more clear on who you are actually against. For example at the moment if I turn on all the possible factions it looks like I'm playing an 8 player game, although looking at the galaxy map I only see me, the Dyson Sphere and the Sentinels. This causes confusion of who I'm actually up against. While I like having the separate flexibility over the Warden and Hunter fleets, they are really just sub factions of the Sentinels overall, and currently we don't do a really good job of explaining that when looking at the map. I think if they were indented a little under the sentinels it would make it a little clearer that they were part of the same "team". Also separating the roaming factions to their own section as well so that we can see at a glance what other factors are in play that won't be on the map. Yeah. I'll try to be more verbose the next time. Thanks for the feedback. I think what really hurt it was some missing tooltips, that explained what sections like "AI Plots" was about. It was a lot of settings to start off with as a new person, so I think an "Advanced Settings" button would be helpful (possibly just above the menu box) which switched you between Advanced and Simple settings for the game, which then broken down the various menus all together. You have a lot of good points. I'll be sure they get passed on to the full team. Thanks! Suggestion: When you enter the lobby there's a button for "Lobby Tutorial". If this is enabled, a series of additional popups will appear: "First, choose your player colour and settings. You can do that here <arrow pointing>" "Then configure the AI" "You can add additional tweaks and minor factions here". This would be similar to the gameplay tutorial. There would be a "Disable tutorial" button. Also, the first time you start a game on a given profile, you will always get the Tutorial.